A feminine take on a classic summer print for your next picnic or fête! Already lost count on how many picnic spreads I’ve already put together this summer! There’s just nothing better than gathering your favorite people in one place and enjoying good food/wine. The weather has been so wonderful lately — perfect even. It’d be silly not to take advantage of all the outdoor events in the city. It’s no secret that I love a good cold shoulder dress. 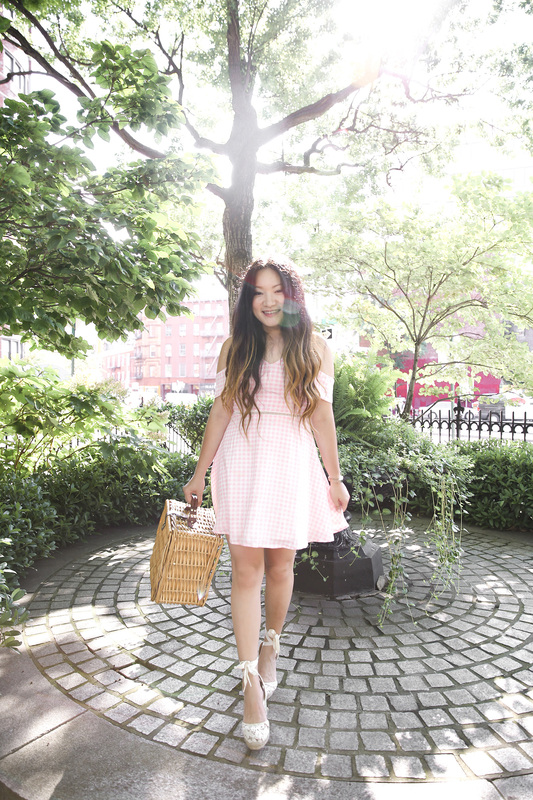 The moment I saw this pink gingham print dress, I knew it’d be perfect for the season. I already have an off-shoulder ruffle version in a deeper shade from last year, but this was too cute to pass up! I am also so smitten with these lace espadrilles I found on sale, too. Already wore them several times since getting it! They are the perfect accessory to any summery look. Hope everyone has been enjoying their summer! i am obsessed with gingham and love this dress so much! This gingham dress is so pretty!